For Yoko Sata Kothari, playing the piano is like breathing. It fuels her life. Kothari, a North Palm Beach resident, recently returned from performing in China with a violinist, her partner in the Lotus Duo. “I was there for a week. We played for dignitaries, we were interviewed by TV stations. I wanted to expose new music to those people. I think they really enjoyed the concert. And for me, being invited to go to China was a big deal. It was a very good experience for me to be able to perform there. 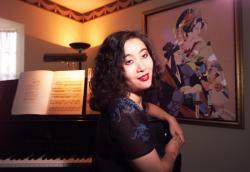 China is a hot place for classical musicians,” she said. Kothari, who has won numerous competitions, including the Northern Japan Classical Piano Competition when she was 8, has been playing the piano since she was 4. “Everybody is cut out for something…some can run fast, some can draw real well. This is what I was cut out to do” said Kothari, who also captured second place in the Bartok-Kabalevsky-Prokofiev International Piano Competition. She also was given the Kathleen McGowan Piano Scholarship Award by the Guild for International Piano Competitions last spring. “Instead of seeing myself as purely a performer, I am, more importantly, one who needs to perform music in order to express myself and my emotions as a spiritual manifestation…I would also like to show my audience how much music can enrich their lives,” she wrote in an application for the Simone Belsky Music Award Competition. Kothari, who was born and raised in Tokyo, took her piano lessons seriously, even when she was little. But there was one point, when she was 22, that she thought she wanted to try something else. So she worked for an airline for two years, but realized her heart belonged to the piano. “Things happen for a reason. I think I needed that time to think. I realized that I wanted to play the piano,” she said. When she’s on stage, she blocks out all the surrounding sounds. “I close my eyes and all I hear is the sound of music. I try to create that feeling so I don’t hear anything else. When I’m playing, I go with the music. I’m a storyteller when I get on stage. If the music is sad, I try to feel that. I want the audience to feel what I feel. It’s just like talking to them. I want them to feel the music,” said Kothari, who got her bachelor’s degree in performing arts from Kunitachi College of Music in Tokyo. Kothari, who has been a guest on WXEL-FM 90.7, also teaches piano and performs with the Boca String Quartet. She is working on a CD, Piano works of J.S. Bach, Beethoven & Liszt. “I’m like a music ambassador. I want to spread the word,” she said. How do you relax before a competition? What’s the one thing you’d like to do?